Rio is still doing great, but I’m not riding him yet, which leaves plenty of time to do other stuff at the barn while I spoil him with extra grazing time. 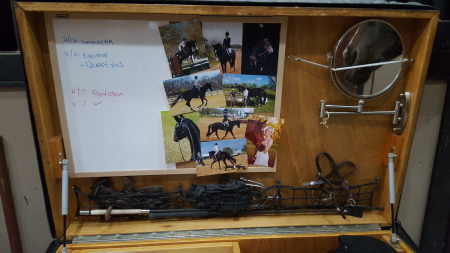 We are moving to a new barn on Monday so I decided it was a good time to clean out the tack trunk. (My trainer is moving her whole program, so I’m not changing programs, just facilities). My sweet hubby built this trunk for me 2 Christmases ago. It is huge and so so nice. #bestpresentever. Step 1 involved emptying the whole thing out so I could clean out the dust. Once emptied, I went through everything to clean it all and decide what didn’t need to be in there- trunk space is muy precious after all 😂. A few things got nixed, and some got re-positioned into lower, less accessible spaces in the trunk. Bottom right compartment is the hardest to get to, so it holds the items I don’t need as often. 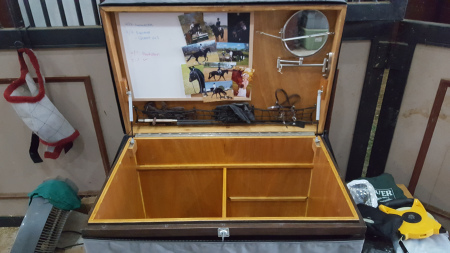 It has all my extra bits, show boots (leather, for eq), fuji boot covers for muddy shows, a Kingsland waterproof rain coat, extension cords, numbers, braiding supplies, de-wormer, measuring tape for setting jumps, and extra halters. 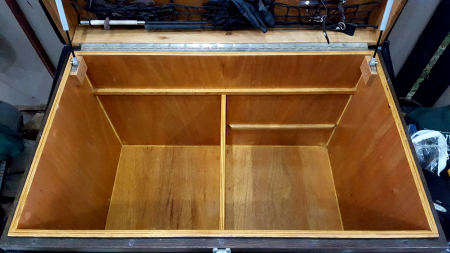 The left compartment hides under the removable tray so its a bit easier to access. I hold my polos, back on track quick wraps and hock boots, a bucket with liniment, sponges, and bathing supplies, gallon of fly spray, clippers with oil and cleaner, CWD cleaning kit, and his show halter. Rio can tell I’m bored as is trying to make me laugh. He was successful to say the least. All loaded back up! 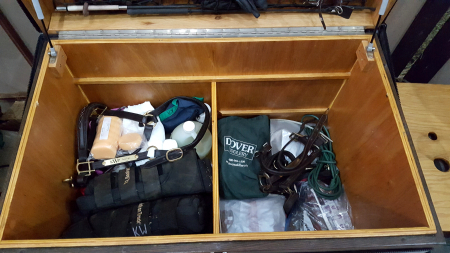 Top right contains medical supplies, boots, grooming tote, a plethora of grooming sprays, fly spray, and helmet. 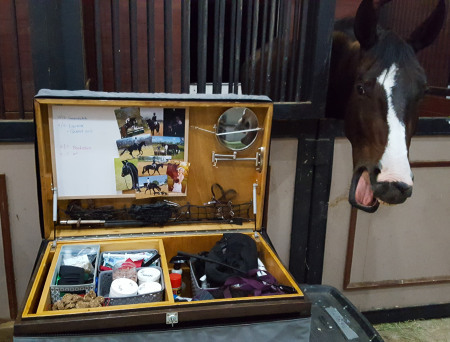 The tray on the left has treats, tack cleaners, baby wipes (for me and to clean Rio’s face and eyes), dry erase markers, pens, chapstick, sunglasses, Bobby pins, a million hairnets, small can of hair spray and dry shampoo, antibacterial, mints…. you know- the absolute essentials! The lid has these amazing nets that hold my gloves,spurs, and whips. The mirror says bungeed when not in use, otherwise it’s super convenient and I love it. Finished product. Dirt free and newly sanitized. Moral of the story…one can never have a big enough trunk!!! If anyone wants to magic my trunk like Hermione’s bag in the last 2 Harry Potter books, I’d be forever in your debt. Annnnd I really need to clean out my trunk … Not sure I know what all is in there right now, other than my groom box, fly spray, cookies, and fly bonnets … there is a whole lot of other stuff stowed beneath an Irish knit that I can probably live without for the summer. Your trunk is great. I don’t own one and wouldn’t have much to put in it. I wish my locker was that clean! But when you could live in it, and its full….its impossible ! Haha. Haha that big huh? You need to take pics and tell us what’s in it! It is that big. 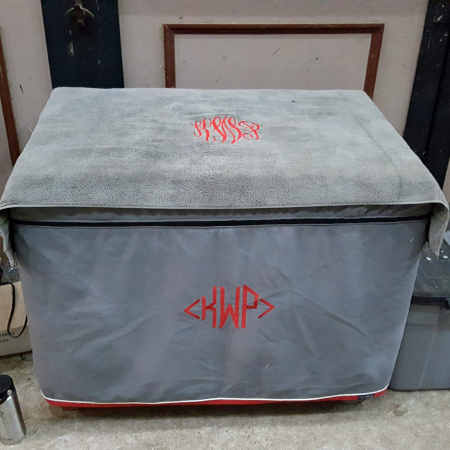 When my group went back to our winter barn in the fall, there was no room in the small tack room, so a couple of us built rolling tack lockers to keep in a stall in the barn. Its 5′ tall by 4′ by 3′. I should do that…I was planning on cleaning it this weekend and adding more hooks! Its a blessing and a curse! I feel like all the things should be in it…..but I am TERRIBLE at organizing and it is just a giant mess! I bet your bf could totally put them in a husky trunk! My hubby got them off Amazon, there are for bikes. Not sure if that means bicycles or motorcycles lol but that’s what I’d search! DO you braid Rio yourself?? I am working on learning! I am a decent braider, but not quite A show quality just yet. I plan on polishing my skills so I can do my own braiding this fall though- to save money! This is amazing! I just purchased my first thousand pound fur baby at the end of April and trunk organization / set up … girl, the struggle is REAL! The way you make use of the top portion with the white board etc. is genius! Thanks for sharing.